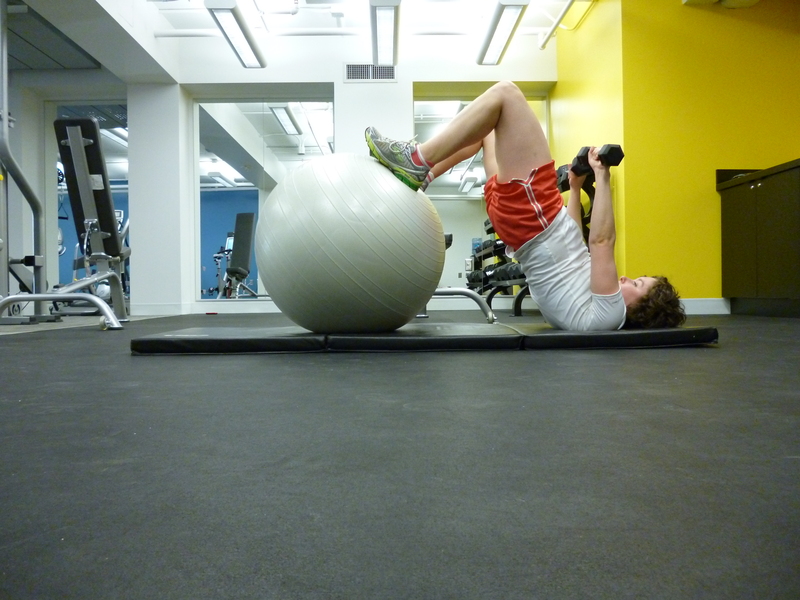 Yesterday I discussed a bit how I’m re-committing to my fitness routine with a new outlook- to push myself. To challenge myself. To make my body feel sore and tired again and really reap the benefits of working out instead of just doing it for the sake of doing it. This new mindset will of course be balanced with adequate rest and recovery to avoid injury, otherwise what would be the point? But I’ve been erring a bit too much on the ‘safe’ side for a while, and it’s time to challenge that. 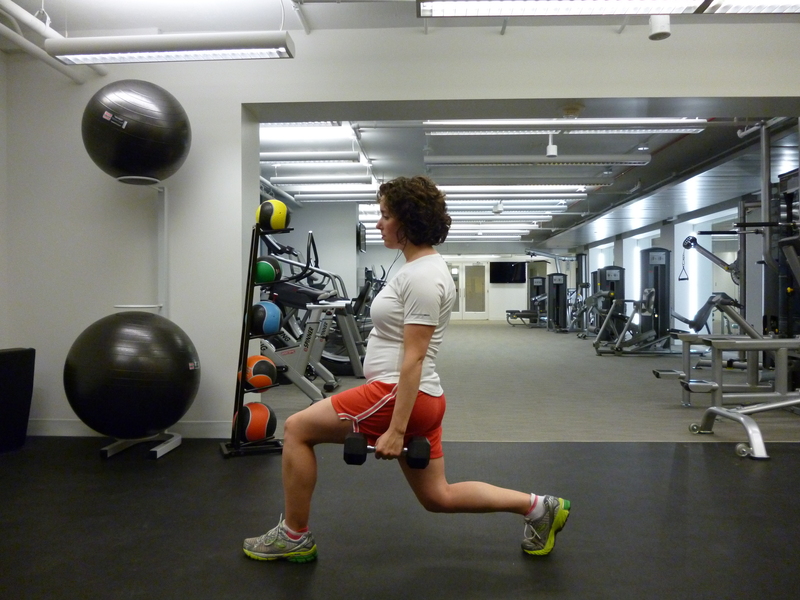 Strength training is the first area I am tackling with this, because I feel like it has suffered the most. 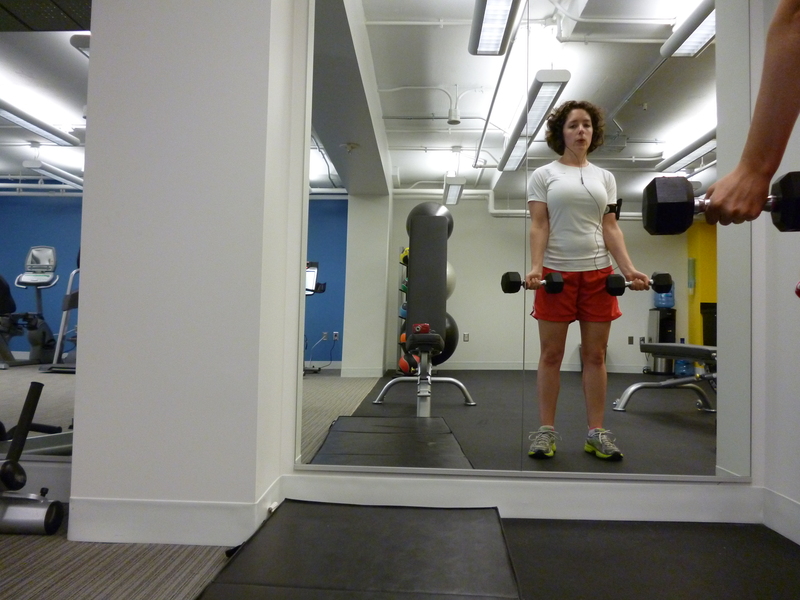 As I got closer to my half marathon in March, I didn’t want to overtax my muscles and backed off my efforts in the office gym, which is where I do my weight work. Work also got very busy, and I was skipping many of my afternoon sessions because there was too much work I ‘had’ to do. 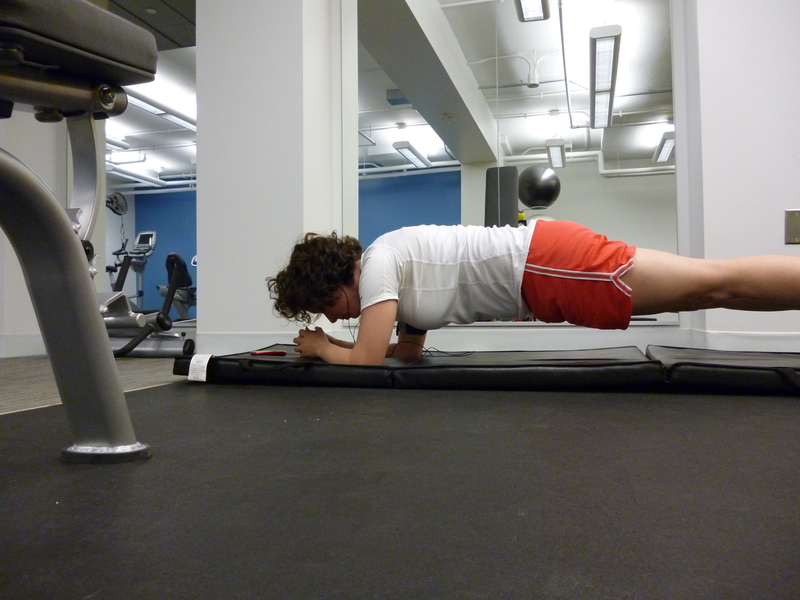 If I did manage to squeeze it in, I just went to my go to exercises and was over and done with in 20 minutes. These were actually just excuses, which deep down I knew. I was bored with my routine. Not only was I not trying out new moves, I wasn’t upping the intensity. So I didn’t want to do it. I also no longer saw changes in my body. Yet another cautionary tale about the need for variety in your fitness regime. 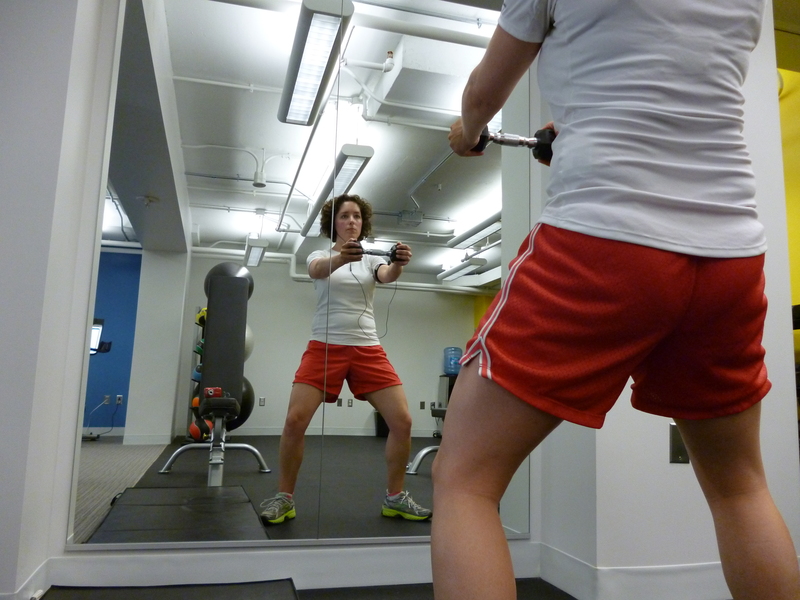 At first, I started looking into group classes like Body Pump or CrossFit that so many people rave about. 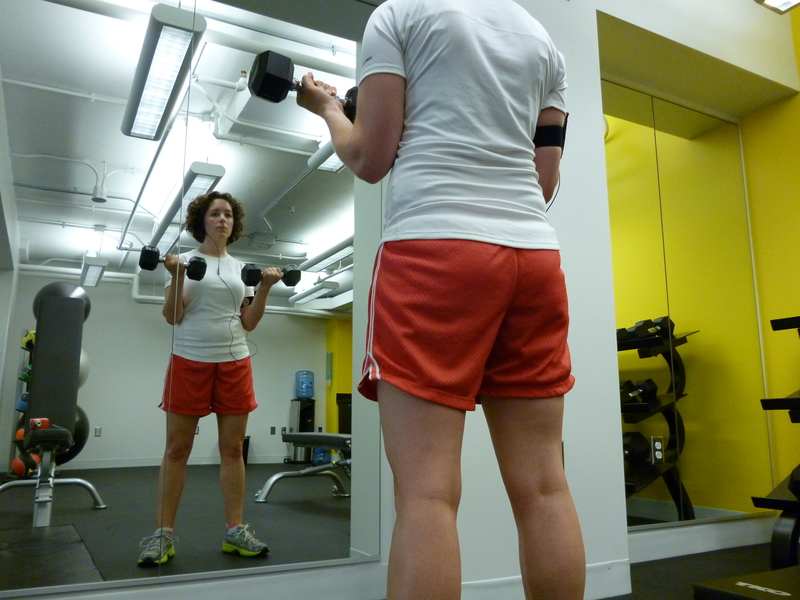 Since I do most of my working out on my own, the class mentality is appealing to me. But ultimately, it’s too much money and I couldn’t consistently find times early enough in the day for me to know that I would keep up a steady commitment. And the more I thought about it, since I have a free office gym, it just seemed silly to pay for such things that honestly I can do myself. 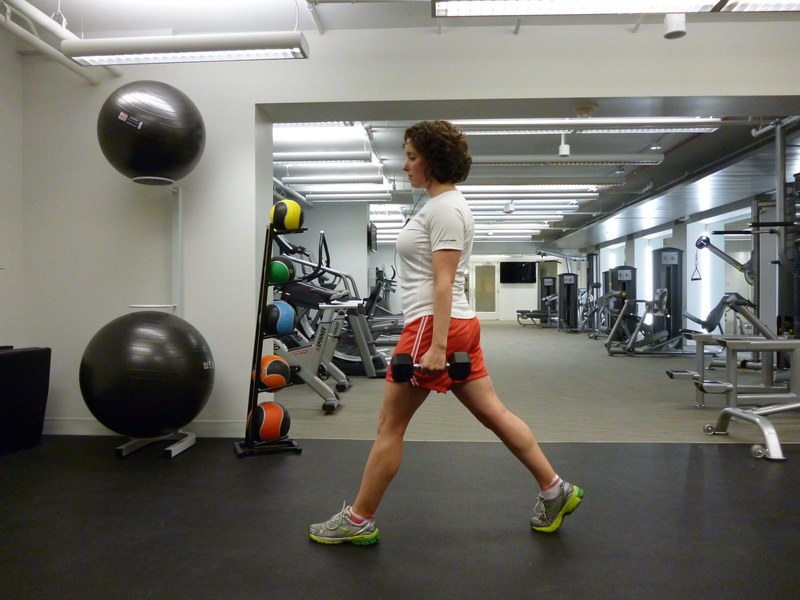 So, the new game plan: Each week, change the routine. There are so many great moves and ideas out there to keep things interesting! This means both new moves and upping the intensity of current ones. 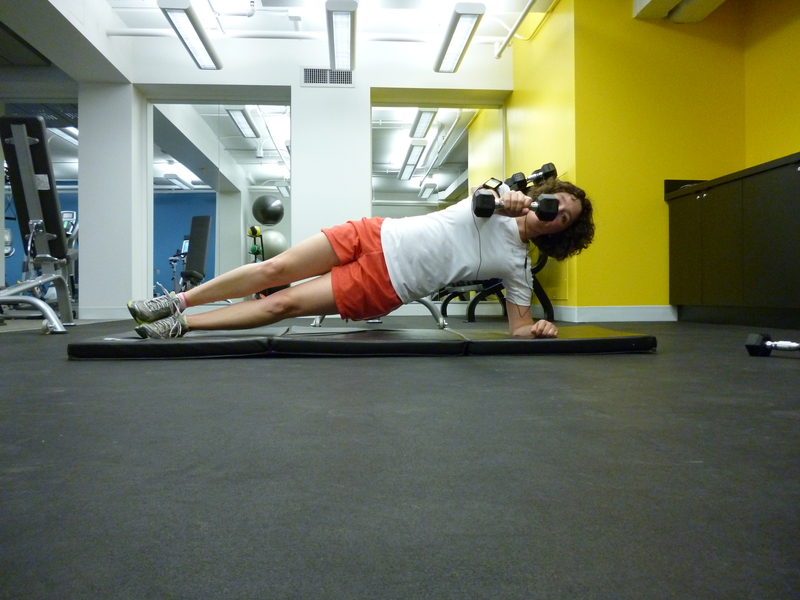 I will aim for four solid sessions in the office gym of at least 25-30 minutes. I will have two routines that alternate days and focus on different muscle groups, although my core will get a workout each day. 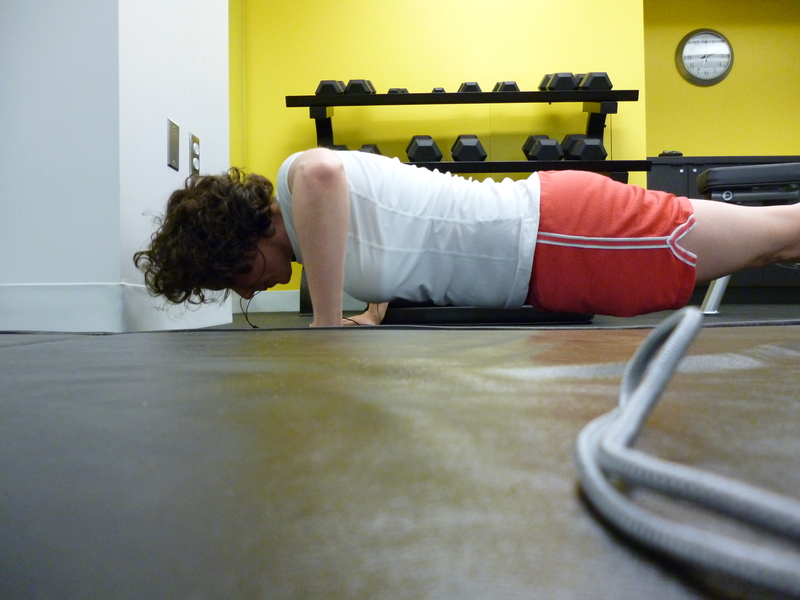 I will keep integrating planks and push-ups on a regular basis, because I like these and they’re good exercises to maintain. This plan began this week in earnest. Monday’s routine was the real tough one, but I’m not repeating it until tomorrow, so I’ll discuss Tuesday’s and today’s routine, which focused on core, lower back and the arms. 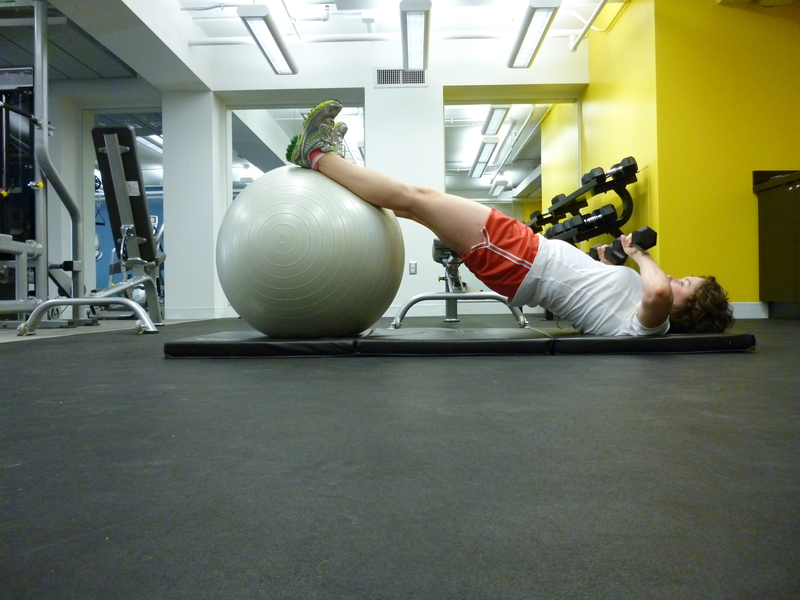 The leg raises and twists were the truly new additions- I did both when I began strength training last year but dropped them for the more efficient plank. 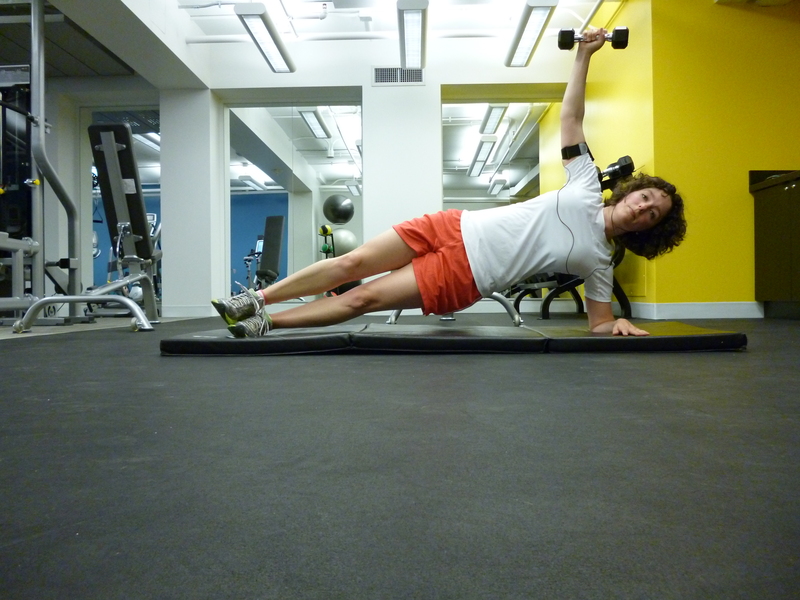 My core muscles were a tad sore the next day- which means my plan is working. Posted in All Posts and tagged Biceps curl, Leg raises, Push-up, strength training, torso twist, workout variety. Bookmark the permalink. This is the last of my spring break recaps. I promise! I hope I haven’t bored all of you too much. I’m definitely diving back into fitness and running tomorrow and have some good ideas for new posts. But this was a very special time for me, so I wanted to share it with everyone and maybe even inspire some to get out into nature more. Plus, seeing how happy my husband was to have all his pictures displayed publicly made this little deviation worth it. 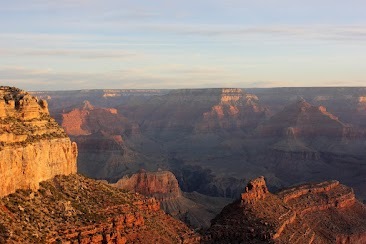 The Grand Canyon is a spectacular ‘hole in the ground.’ It’s really a sight to see. But now that we’ve seen it, we don’t really have a desire to go back. We just didn’t seem to ‘connect’ with the park the same way we did with the others on our journey. It seems less nature and more tourist. It makes sense- this is after all one of the (if not THE) most visited national parks, with millions of visitors each year. And with that in mind, it’s really well run- great shuttle system, lots of food options and places to stay. The path along the rim is paved so everyone can easily access the overlooks, and the shuttle system carries you around much of the rim if you’re not up to much hiking. But to us, it just lost a bit of the magic with all these innovations. Plus, we were apparently visiting during one of their busiest weeks of the year- not having a family, we forgot about spring break for schools. So we felt constantly surrounded by people, even on our more difficult hike. Anyway- we arrived in the afternoon, and after some stress trying to figure out where to park and dealing with unexpected masses of people, we checked into the El Tovar. This is a really cool hotel literally feet away from the rim. 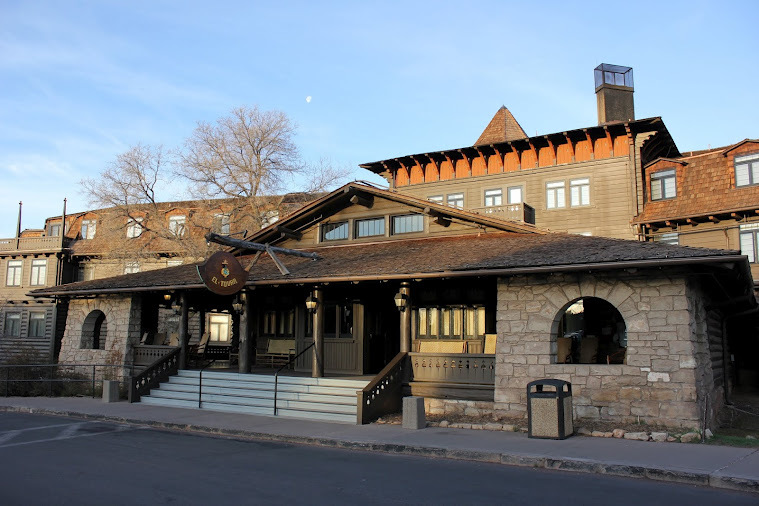 It’s also a National Historic Landmark due to its age and unique structure. It was fun to stay there for a night. We decided to keep it low-key since we were anticipating a strenuous hike into the canyon the next day. So we rode one of the shuttles out to a viewpoint that was about two miles from the hotel and walked back along the rim. The lighting at that time of day was really nice and the views were pretty wonderful. We went to see a ranger presentation later that night. 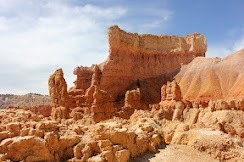 I LOVE these programs at National Parks, they are always fascinating. This was probably the best one I’ve ever seen. If you’re at the Grand Canyon and lucky enough to be able to see Ranger Ron give his living history on ‘Captain’ John Hance- GO. 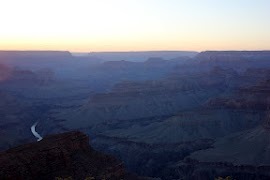 We got up to walk out to the rim from the hotel and watch the sunrise- pretty spectacular. It is a pretty steep 1.5 mile hike down to the first resting point. 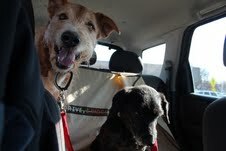 We just wanted to get into the canyon a bit to experience that, but didn’t really have an interest in venturing further. Plus we didn’t want to be hiking in there during the afternoon sun. We were really glad hiking back up that we had gone early since most of it was shaded at this time of the morning. We took the shuttle to the visitors center, and then walked the rim another 2.5 miles or so back to the hotel. At this point, both our feet were very tired. So, aside from setting up camp for that night’s sleep…we didn’t do much the rest of the day besides catch the sunset. The next day, we rose early again to see the sunrise and have breakfast at the El Tovar (again- it was really good!). We then drove to Las Vegas, where we spent the night before our early flight back to Cleveland the following day. I’m not a Vegas person, but the hotel was really nice and we had a fabulous dinner at Stripsteak in the Mandalay Bay as a sort of send off for our trip. 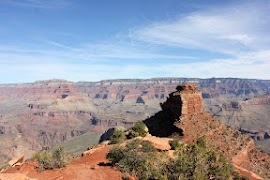 Posted in All Posts and tagged El Tovar Hotel, Grand Canyon, Hiking, Mandalay Bay, National park. Bookmark the permalink. Obviously the goals of the trip evolved a lot since that time almost seven years ago, and parks like Zion and Bryce may have surpassed Arches as the dream destination. 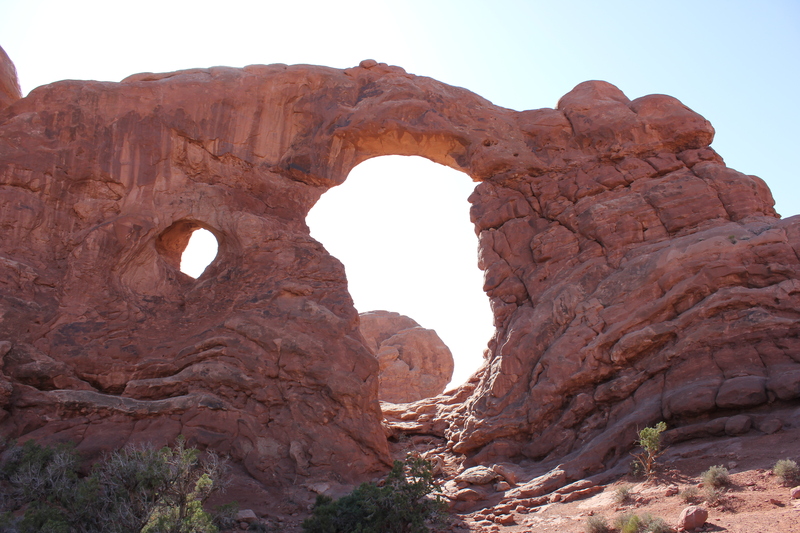 But I never would have expanded my horizons to seek out those parks had it not been for Arches. 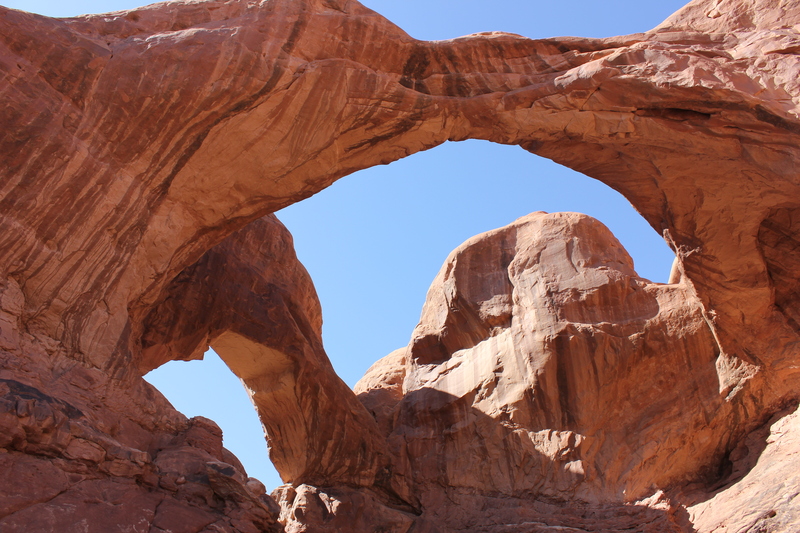 The park is aptly named due to the fact that it is the largest collection of free standing natural arches in the world. And we did our best to see many of them. We got started somewhat early, and it was quickly warming up. 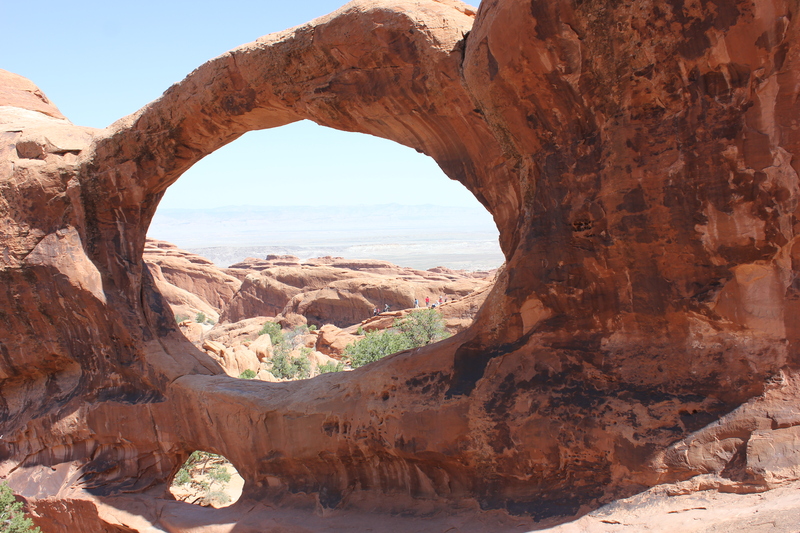 Arches is definitely a desert park- lots of sand and very little shade. At this time of year it didn’t get oppressively hot, but it was sufficient for me to be glad that we didn’t wait to go any later in the year. Believe it or not, there is over 300 feet laying between the two ends of that arch, or an entire football field base to base. It’s hard to conceptualize because you can’t get too close, but it’s beautiful regardless. The trail actually continued beyond that to make a seven mile loop into ‘primitive’ trail, which I take to mean mostly sand. We were tempted to do that since a lot of hidden gems were supposed to be there. But we also knew we wanted to do the Delicate Arch hike around sunset which, while only three miles round trip, is supposed to be a very difficult one. So instead we returned to the car and drove back to Moab to set up our campsite in town. 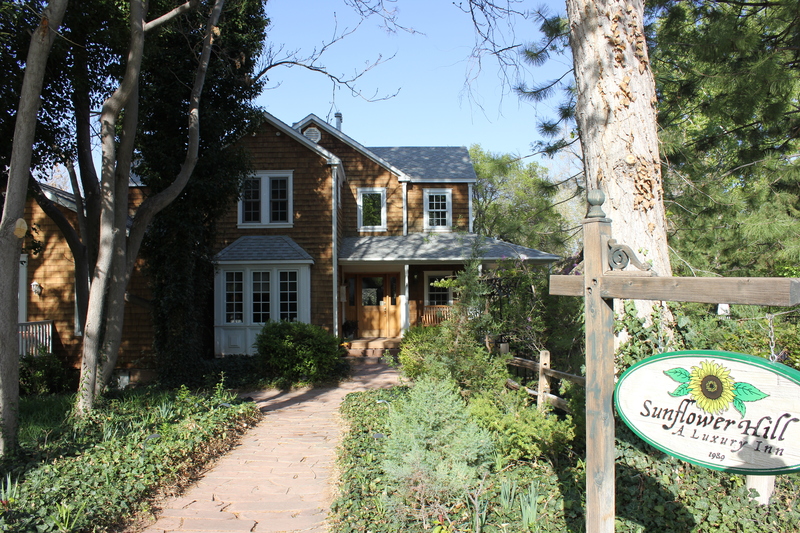 Our first two nights in Moab we stayed at the Sunflower Hill Inn, which was a wonderful find by my husband. 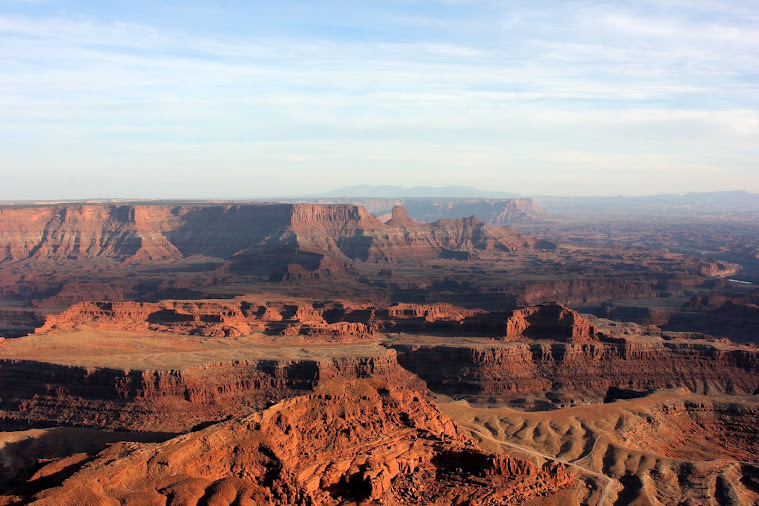 When we go back to Moab, we’ll definitely stay there again. But for our third night, we camped. 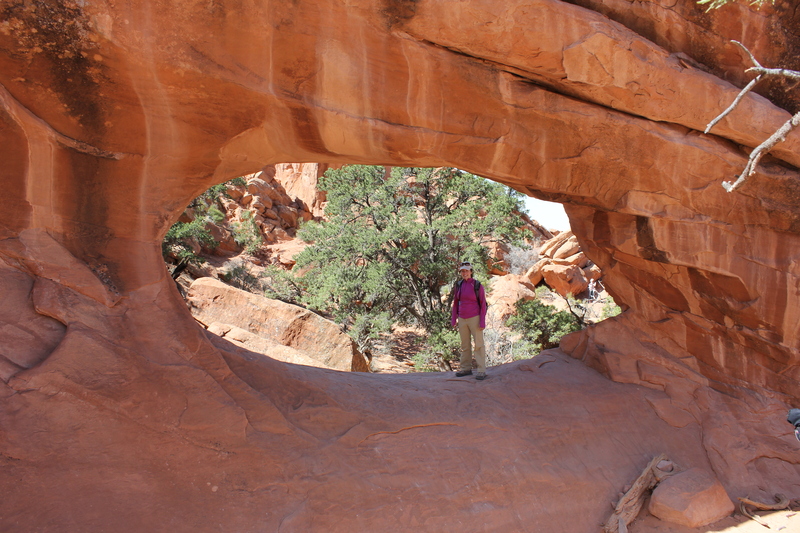 Nice enough campground, but I’d like to try to get in Arches or Canyonlands next time. 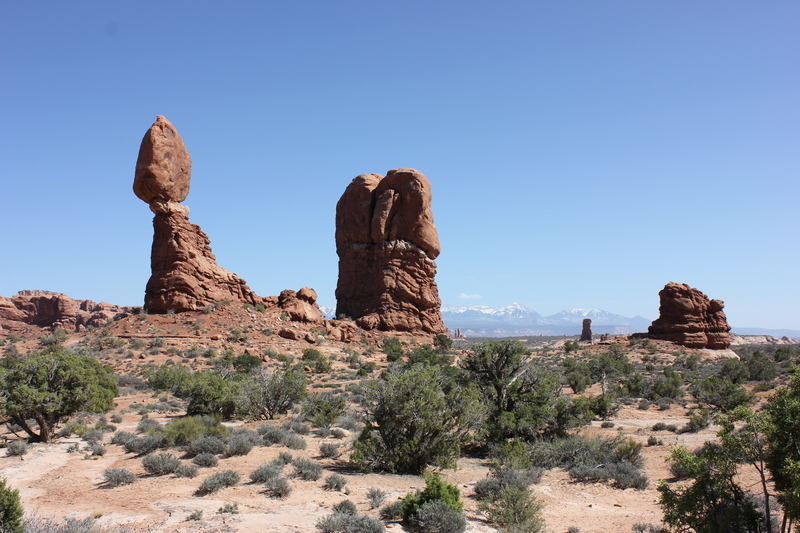 After we set up and relaxed a bit, we headed back to Arches to do a series of mini-hikes to several other arches and rock formations before our impending Delicate Arch hike. It was pretty warm at this point, and I had a minor headache, so it was good to just do some easy sightseeing- and there were lots of sights to see. After all that, around 5:15 we began our climb to the Delicate Arch. 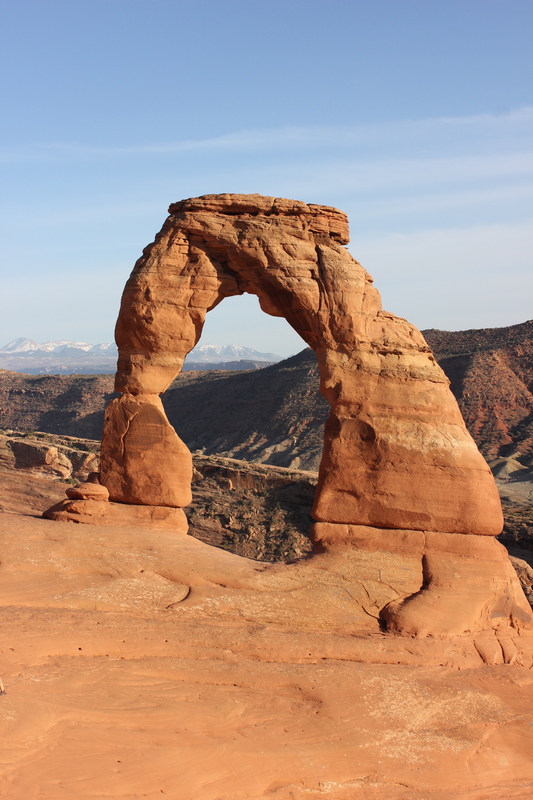 The Delicate Arch is THE Arch- it’s Utah’s official symbol. It’s a difficult hike, but once you get there you understand why Utah is so proud of it (and Utah has a lot to be proud of, it seems unfair that one state gets so much beauty to choose from). 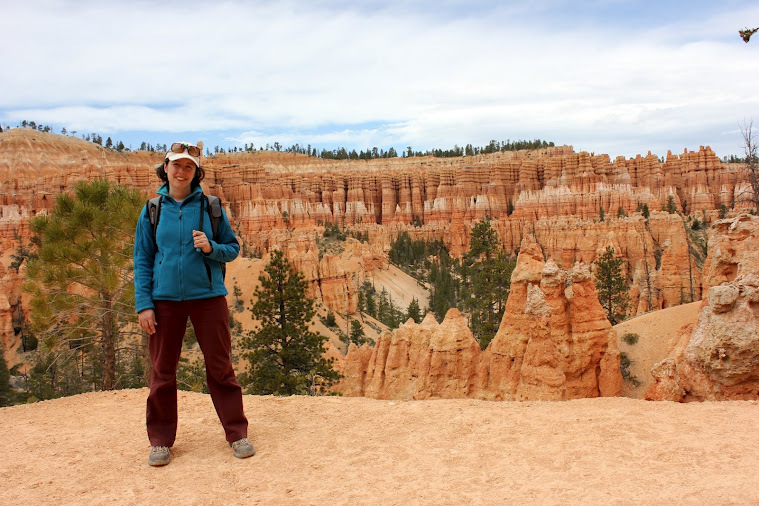 In retrospect, the hike isn’t the most difficult I’ve done due to the terrain- it’s challenging, don’t get me wrong, just not as bad as the Bryce hike or even our climb up from Crater Lake after our boat tour. But you’re in the beating sun the entire time, in addition to being at least 7,000 feet up. Those factors combine, along with my cranky headache, made it tough. But being able to see this is completely worth the strenuous effort. 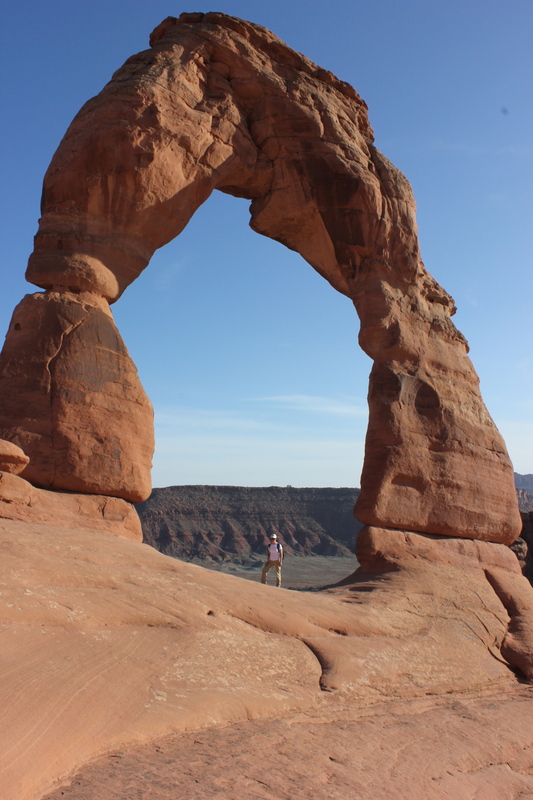 Me in the Delicate Arch- yup, it's that big! After hanging out a while and chatting with other fellow hikers, we headed back down before it got dark and grabbed dinner at the Moab Brewery for the second night in a row- surprisingly good food at really good prices. Plus they had tasty microbrews on site. 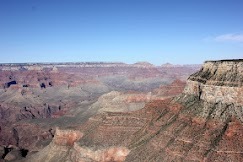 It was a great send off to the Grand Canyon, the last park on our itinerary…. 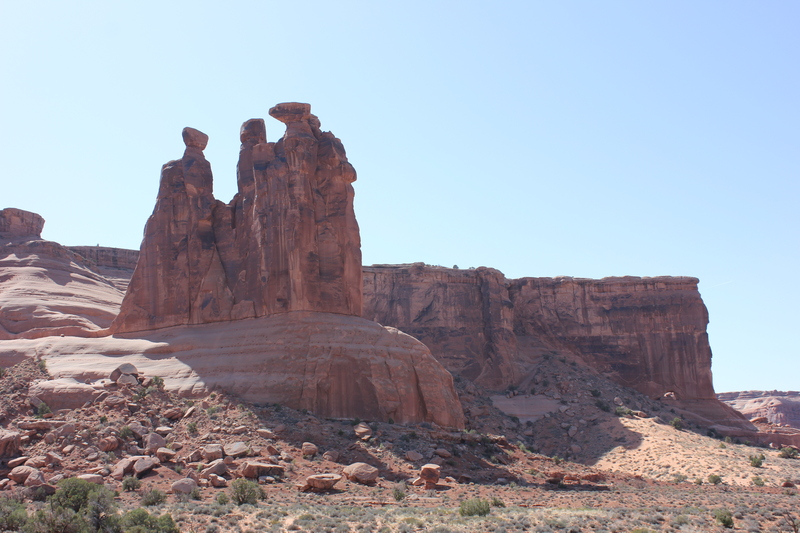 Posted in All Posts and tagged Arches National Park, Balanced Rock, Canyonlands National Park, Delicate Arch, Hiking, Landscape Arch, Moab, Southwest. Bookmark the permalink. I’m combining two days of my trip in one post because we didn’t do much hiking and were only able to take a few pictures. But there were still plenty of great memories. 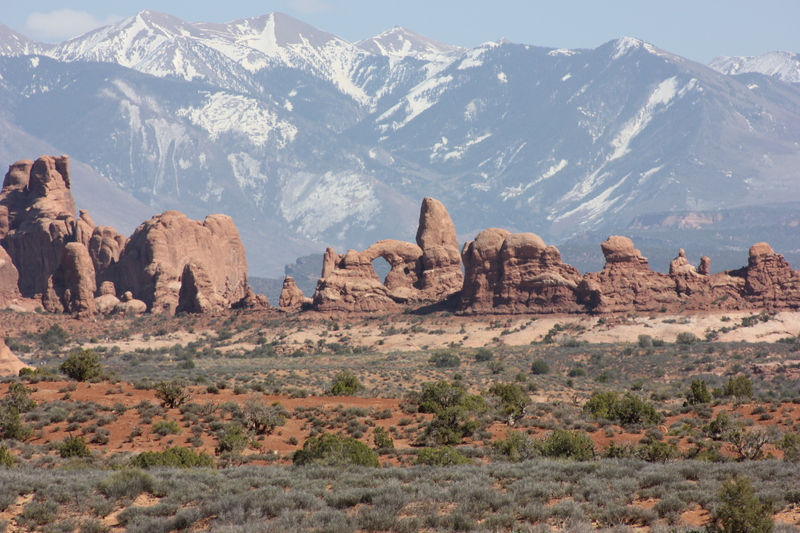 After Bryce Canyon, we drove the historic Highway 12 to Moab, UT. Well we had to take Highways 24 and 70 as well, but 12 was the main show. My former boss and mentor insisted that we take that route on our way to Moab, and as usual she was so on the money. 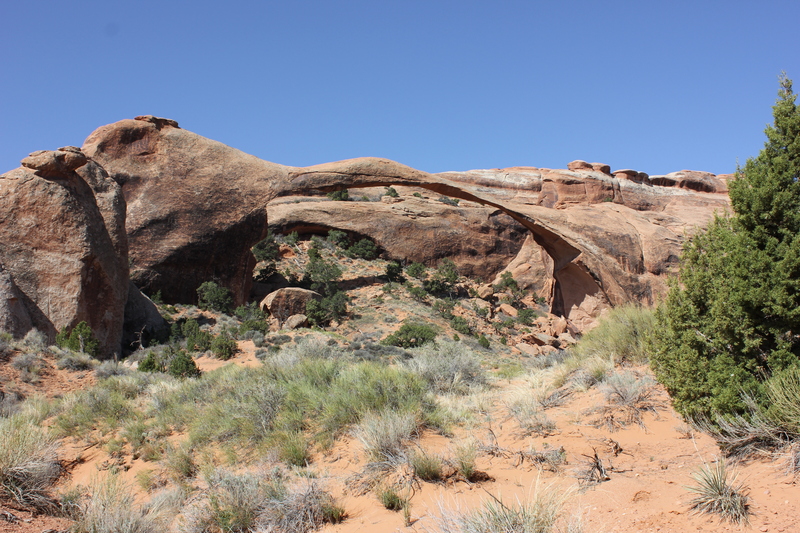 The highway travels through out the vast Grand Staircase Escalante (which, as an environmental policy wonk…ok… NERD…was very exciting to me). 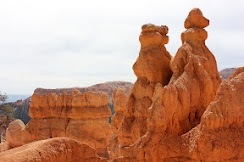 The road winds you through amazing rock formations and steep cliffs- my husband has a small fear of heights and as the primary driver, this freaked him out a bit. It was one of the most scenic long drives I’ve ever taken, second only to Route 1 along the West Coast- a very high standard! We also ascended a mountain, not realizing how high up we were until we saw a sign at the peak that read 9,600 feet. Wow! 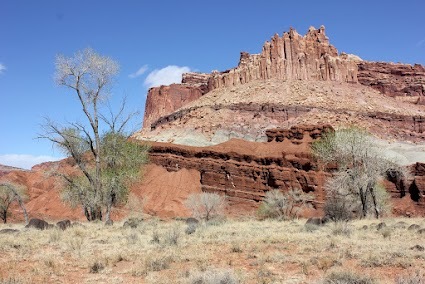 Highway 24 then takes you straight through Capitol Reef National Park, one of the lesser known and populated parks. Its deep red rocks and formations were so impressive, we wished we had left more time to spend there than just drive through. It’s on our list of reasons why we NEED to go back to the region. 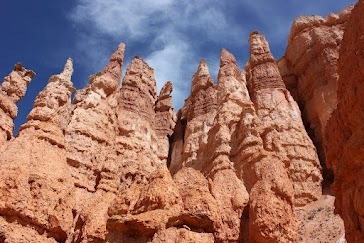 This formation was really cool but we can't remember what it was called. 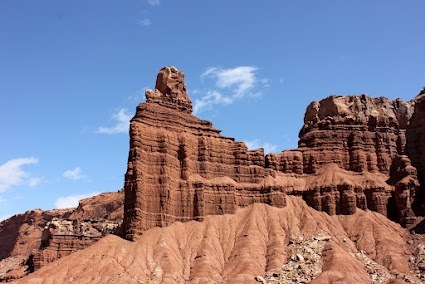 The Castle formation at Capitol Reef. The next day, our first of two full ones in Moab, we went whitewater rafting on the Colorado river. I have only been rafting like this once in high school up in New Hampshire and my husband never has. We had a blast- category three and four rapids give you a serious rush. One of the rapids is called Skull Rapid and the Room of Doom- need I say more? However, such exhilaration is not conducive to picture-taking. When we wrapped up around 5:30 pm, our riverguide emphatically told us to jump in the car and go check out Dead Horse Point State Park for sunset. He described it as a mini-Grand Canyon. That is a very apt description. In fact, we actually preferred it to the Grand Canyon for a number of reasons. This was such a highlight of the trip, I think mainly because it’s not a main attraction. We felt like we discovered a secret gem in the region. Sunset from the rim of Dead Horse Point. Moab is a great little rustic town. Day Two proved to be just as much fun as the first…. Posted in All Posts and tagged Capitol Reef National Park, Colorado River, Dead Horse Point, Grand Staircase-Escalante National Monument, Moab Utah. Bookmark the permalink.